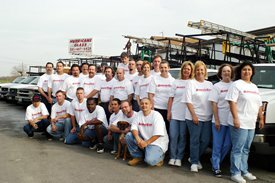 Hurricane Glass was established in 1985 in a garage shop in Pasadena, Texas. With-in a few months of door to door sales and a one man operation, I	was able to move into my first real shop in Houston where my business	grew into a full service glass company. By 1990 my business was thriving	and had accumulated a great customer base which gave me to means to purchase	my permanent place of operation, which is located at 1418 Indiana St in	beautiful South Houston, Texas. Currently, I employ 25 service personnel	and an office staff of five, which has a combined experience in the glass	industry that spans decades. As a full-time hands on owner, I work along	side my wife and employees to continue to bring excellent service and	exceptional customer service to Harris and all surrounding counties.